I'm offering personalised guitar and vocal lessons to students of all ages. Whatever you need to perform your own songs or the songs of your idols, I am going to hand you the tools to do so. If you are from the surrounding area of "Königs Wusterhausen" in Brandenburg, Germany we will meet at your place and discuss all the details, otherwise please send me a mail regarding Skype lessons. Let's get you ready for the stage! 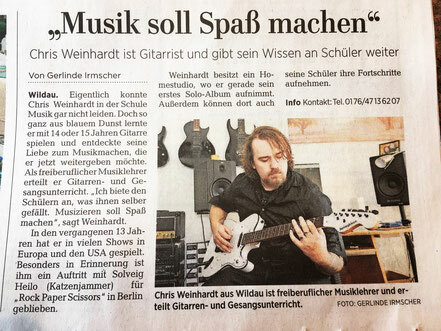 An article about my work as a music teacher from the local newspaper "Märkische Allgemeine".